Posted by Judy Orr on Thursday, October 4th, 2007 at 9:12am. Sadly, that treasure, dangerous or not, will be leaving us. Cook County Forest Preserve District commissioners voted this week to get rid of the slides and regrade the hill for sledding. They feel repairing them would cost too much. It was stated that fixing them would run around $4 million, whereas removing them and regrading the hill would be approximately $1.3 million dollars. They were officially closed down in 2004 but were operable for decades. However, weather had to be cooperative for them to be used with enough snow (at least 4 inches) and temps of 25 degrees or under. These are not the only slides that will be removed in Cook County. 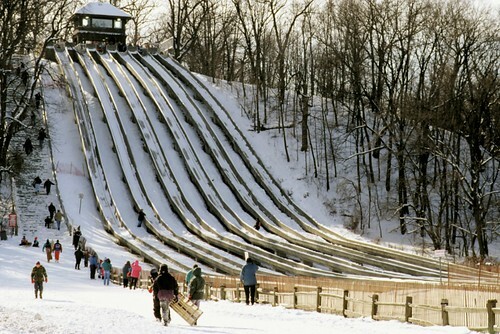 I thought we had the only toboggan slides in the area but others are being removed from Bemis Woods in Western Springs and Deer Grove in Palatine. Even though I had no use for these slides I guess I'm just a sentimental fool. There were a couple others on the committee that did not want this memory erased but they were outnumbered by their opponents and the financial facts. I'll need to take my grandkids out there and take more photos to remember this piece of Palos Park real estate before it's gone.